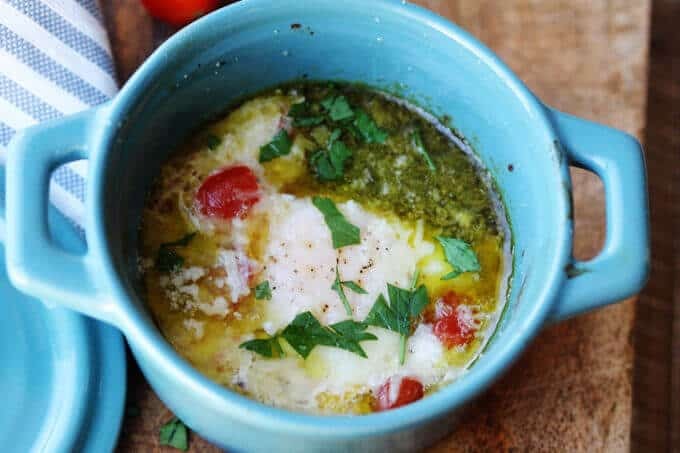 These Baked Eggs with Tomatoes and Pesto can be added to your ketogenic breakfast menu if you are looking for low carb recipes. It’s super quick, delicious, naturally low in carbs and packed full of healthy fats. For the last few weeks I have been trying to incorporate a ketogenic diet into my life. I’ve been struggling with loosing the last ten pounds since having a baby a year ago and decided to give this super popular diet a try. The principles of this diet are simple: eat a minimal amount of carbs and lots of healthy fats. But it actually is easier said than done. Obviously your options are limited, so you’ll have to get creative in order to not get bored by eating the same foods over & over again. I must say, ever since I started this diet I’ve created a few dishes that were so good that I couldn’t stop talking about them. While on keto diet, eggs are your best friends. But I got bored with boiled, scrambled & fried, so I decided to use these ramekins (affiliate link) and bake myself some delicious eggs. 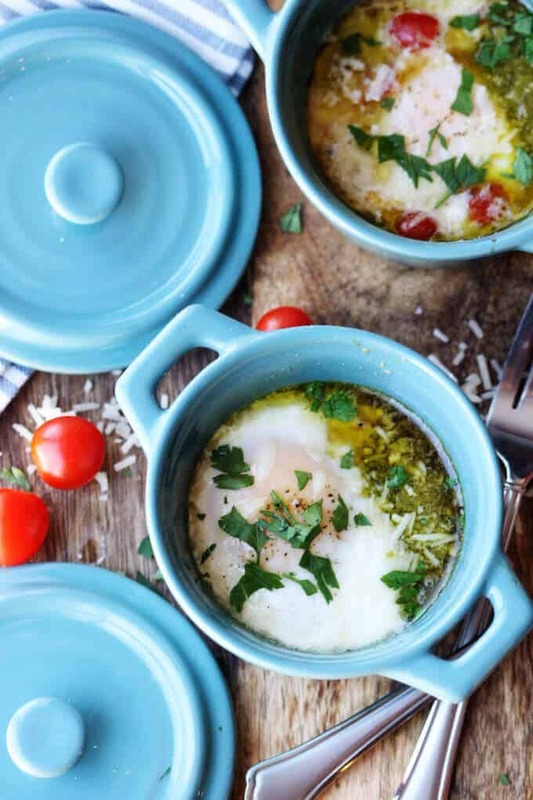 That’s how this Baked Eggs with Tomatoes and Pesto recipe was born. 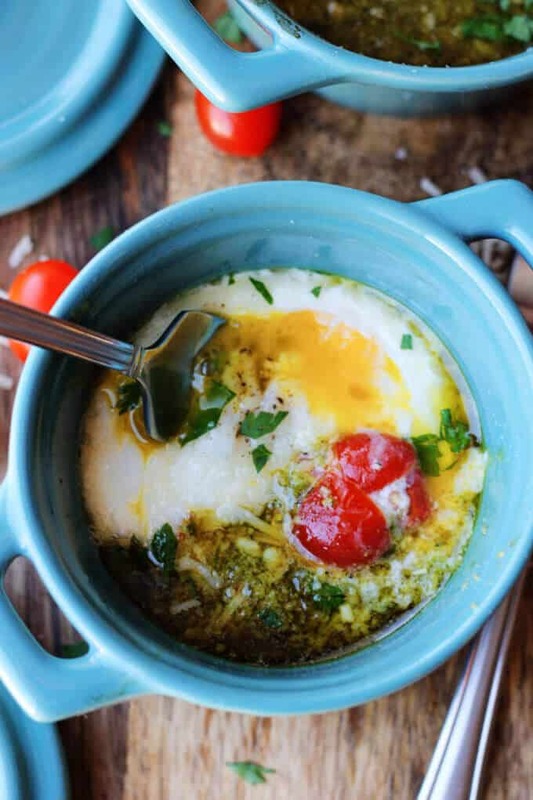 While they are keto approved, you can enjoy these baked eggs with tomatoes and pesto even if you aren’t following this diet. In fact, if you aren’t constrained by the diet, then I’d suggest dunking an amazing crusty bread into them and indulging in this amazing combination of tastes. When egg yolk runs and mixes with the pesto, butter and parmesan; something really magical happens. It’s just crazy good! You can nix the pesto when baking, and then just add as much or as little as you want once the eggs are baked. 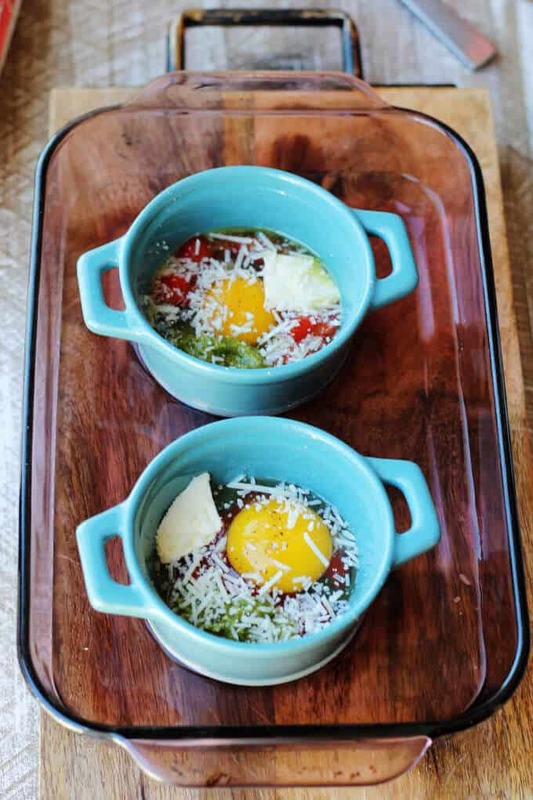 Prior to this post, I’ve also made two other baked eggs recipes: Baked Eggs with Tomatoes and Feta, and Oven Baked Eggs with Sausage and Peppers. For this recipe of Baked Eggs with Tomatoes and Pesto I used different technique. I placed the ramekins (affiliate link) in a baking dish with water filled half way up the ramekins (affiliate link) (this technique is similar to one used for creme brûlée – it keeps the oven air moist and cooks the eggs evenly). Whether on keto diet or not, make yourself these delicious eggs and let me know how you liked them. 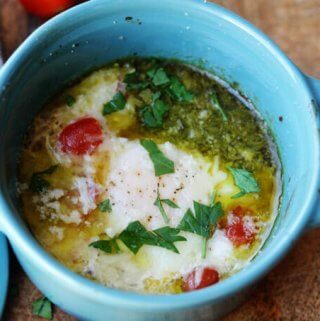 These Baked Eggs with Tomatoes and Pesto can be added to your ketogenic breakfast menu if you are looking for low carb recipes. It's super quick, delicious, naturally low in carbs and packed full of healthy fats. Bake eggs for approximately 15 minutes** until the whites are set but the yolks are still running. *You can bake eggs without pesto and add it once the eggs are done. **It may take few minutes more or less to cook your eggs. 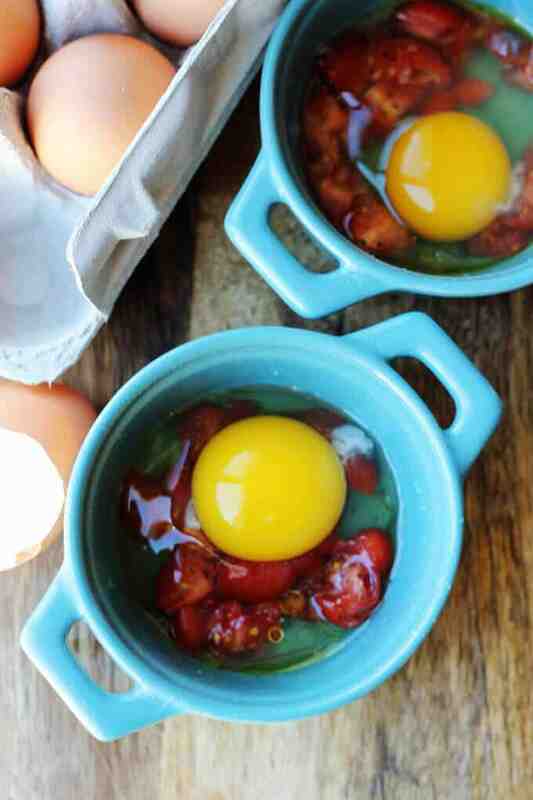 It will depend on a size of the ramekins and also on a size of the eggs. Watch your eggs carefully and take out when done. Cacio e Pepe Zucchini Noodles - healthy cheesy "pasta"
Good for you for giving this diet a go. If all the food you can it looks like this delicious recipe, I’m in! YUMMY! 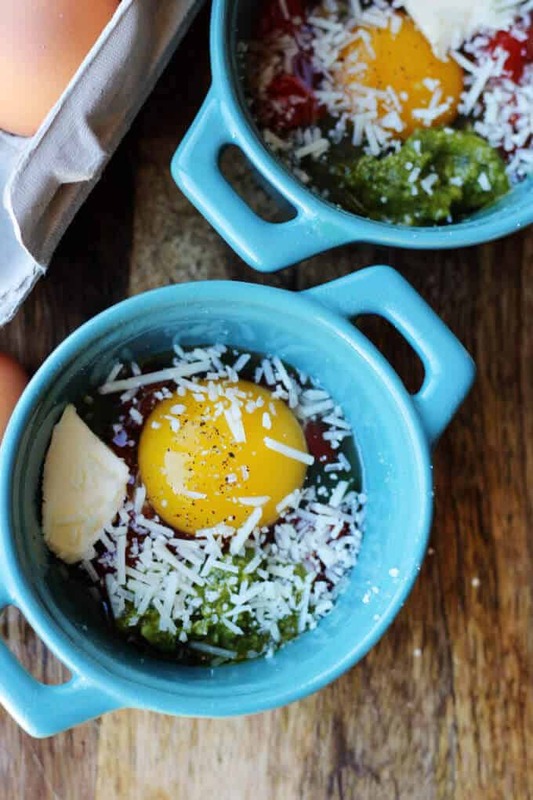 Ooooh eggs and pesto are so fantastic together!! I’ve never thought about combining pesto with eggs. This looks and sounds delicious! Thank you Jill. It really is delicious. 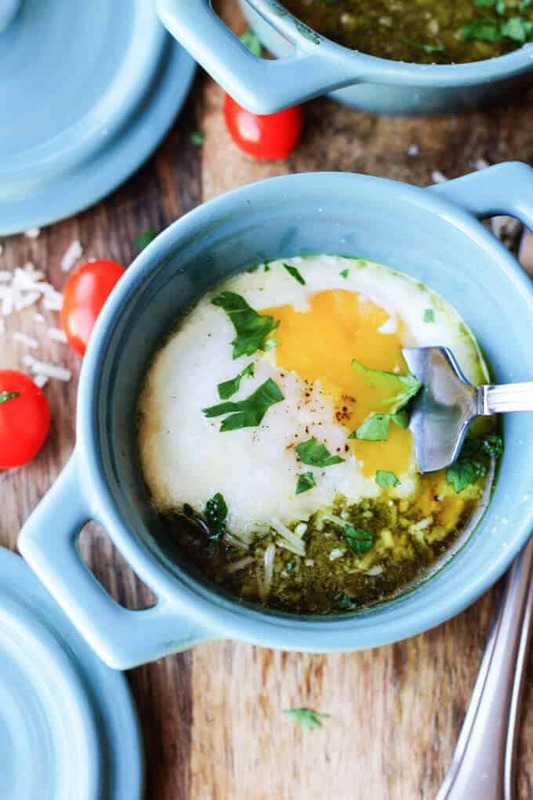 I lovvvvve pesto-baked eggs! One of my fav breakfasts of all time!! I’m pinning this for sure…great recipe! Great! Thanks so much Traci! 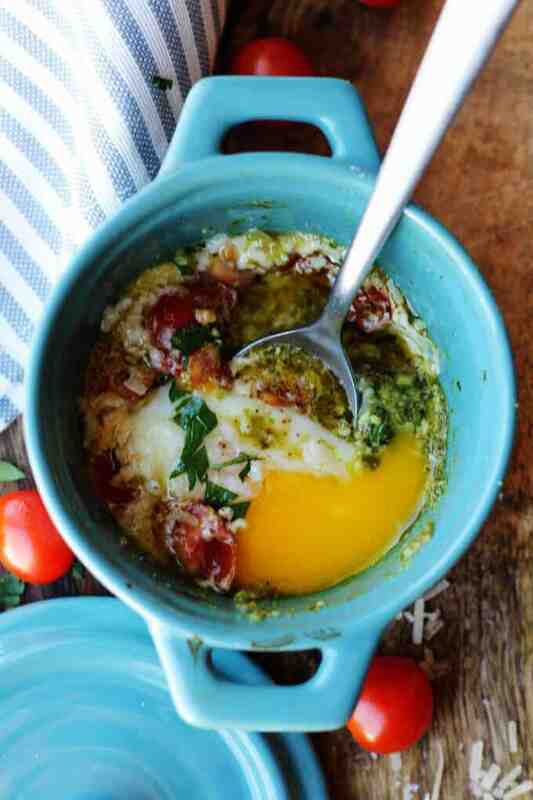 I love baked eggs and this pesto version looks like a delicious breakfast option.